Roger Degagne is one of eight pin collectors set up at the ArenaWinnipeg’s self-professed “Prince of Pins” is after at least one unique collection. “My dream is to some day collect every Canadian curling club pin that exists.” Roger Degagne said yesterday. Degagne, 60, is one of the eight pin collectors who have set up tables at the Winnipeg Arena during the Ford World Curling Championships this week – three from Manitoba, three from Alberta and two from Ontario. And there have been a number of curious curling fans who at least take long looks at the displays, especially kids. Of course, to host a major curling event anywhere without the pin men would be like curlers playing without brooms. Although many think these collectors are weirdoes, Degane said they do not get a lot of strange looks. “Not at all,” he said. “A lot of people find it an amazing hobby but don’t know how to get started. It’s good to get the young generation involved because it’s not all that expensive and it’s such a sociable hobby. I’ve made friends with collectors from Scotland to Ontario. Degagne , who once collected pins from all different kinds of sports, decided to stick with curling pins back at the 2000 Brier in Saskatoon. Degagne used to own a construction company and now works as a manufacturer’s rep (windows and doors). He travels to every Brier, Scott Tournament of Hearts and Olympic trials events. And he will go to world championships if they are held nearby, such as Bismarck, N.D., last year. Each host committee gives the collectors free space at the arenas to set up their tables, he added. The most expensive pins available are the 1927 Gold Heart Brier pins. There were apparently only 12 made and only eight available. The Halifax Curling Club, which has four of them once spurned an offer of $50,000 for the quartet. 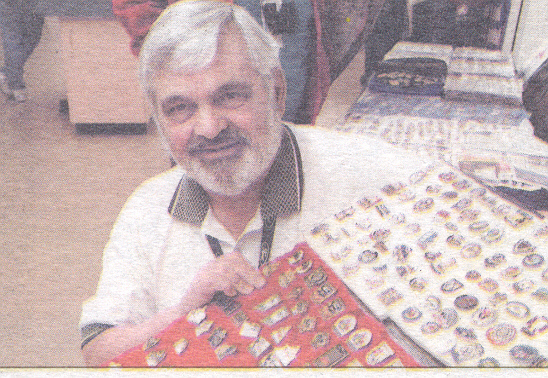 Keith Forbes, who has also set up a display at the Arena, boasts Manitoba’s largest collection with about 16,000 pins.